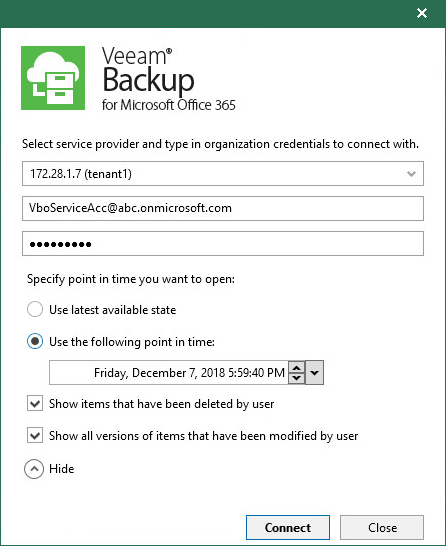 Veeam Explorer for Microsoft OneDrive for Business allows you to add Microsoft Office 365 organization backups located on service providers servers. From the Start menu, launch Veeam Explorer for Microsoft OneDrive for Business. 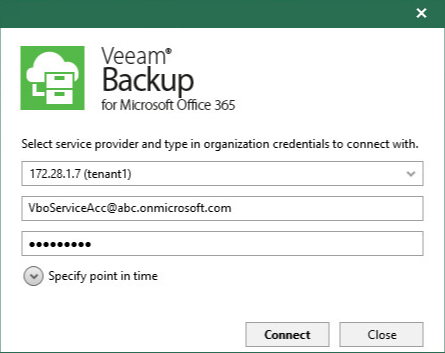 On the toolbar, click Add Org > Veeam Backup for Microsoft Office 365 Service Provider or use the corresponding context menu command. When you connect to the service provider server, you may want to select a particular state as of which to add an organization database to the Veeam Explorer for Microsoft OneDrive for Business scope. Specify a point in time state you want to open. Use latest available state. Select this option to load the latest backup state. Use the following point in time. Select this option if you want to load a particular state of your database. For example, as of a month ago.